Selected article from the GR archive, first published in November 2017. Missing from corporate media accounts is what causes the Democratic People’s Republic of Korea (DPRK aka North Korea) to be singled out for opprobrium for what, essentially, is developing a deterrent against any entity that would attack it. A comparison with how the United Nations deals with North Korea vis-à-vis another member state state, Israel, is instructive. Israel occupies Palestinian territory; destroys Palestinian olive groves and poisons Palestinian sheep; sprays Palestinian homes with sewage; sabotages Palestinian water supplies; cuts off power to Palestine; terrorizes Palestinians for hours at checkpoints, including the sick, infirm, and pregnant women, some who are forced to give birth at the checkpoints; stops fishermen from earning a living from the sea; shells hospitals, schools, and playgrounds; blows up kids on beaches; and commits myriad other war crimes. Israel has nuclear weapons and ICBMs. The last point is the only one that North Korea shares with Israel. Yet only North Korea is vociferously criticized and sanctioned by the US and its allies. Is this fair? And is it just that North Korea is bullied and sanctioned for developing a self-defense? Israel was brought into existence by the UN granting Palestinian land from Mandate Palestine to Jews, who happened to be mainly migrant Jews from another continent – Europe. North Korea was created by World War II victors, predominantly the United States, splitting a country into two halves. Thereby, one ethnic group was separated from the other by a border. Whereas the Koreans are indigenous to Korea, Americans are occupying the territory of many Indigenous nations, as are Jewish Israelis (with the exception of Mizrahi Jews) occupying Arab territories. Israel signifies a situation whereby one group of outsiders was favorably positioned by the UN to carry out an occupation of an Indigenous people. The DPRK signifies a situation where a people indigenous to a territory were separated from kin by an outside entity. The self-determination of Koreans was not respected. Notably, the US came into existence as a colonizer, a colonial-settler state, that remains in occupation of the territory of many Indigenous peoples; this includes the Hawaiian islands, Puerto Rico, Guam, Saipan, and other islands of Micronesia, the Chagos archipelago, etc. Over and over again, the US and NATO ideologues describe the DPRK as a threat. Why? What country has DPRK ever been at war with other than an internecine conflict with the Republic of Korea over half a century ago, a war into which the US inserted itself and the United Nations provided diplomatic approbation. Since the preamble to the UN Charter stated its determination to allay future generations from experiencing the scourge of war, what could be more hypocritical than for the UN to authorize war against another UN member? The scope of the tendentiousness of the US and UN becomes fully transparent when the case of Israel is considered. The case of Israel is another blight on the UN as it abnegated its Article 1 which calls for “respect for the principle of equal rights and self-determination of peoples.” The people of Mandate Palestine were not permitted self-determination, and the land was carved up. The Palestinian majority wound up with 42 percent of the land, the Jews were gifted 56 percent of Palestinian land, and Jerusalem was designated an international city. Palestinians rejected the plan. Subsequently Jews ethnically cleansed Palestinians from the land, waged wars, built settlements in occupied Palestine, and erected an illegal wall that has rendered the remainder of Palestine into discontiguous bantustans. Israel has hardly been a sterling member of the UN, and the list of UN Resolutions targeting Israel is long. The list would be much longer were it not for the US wielding its veto power in the UN Security Council. If indeed the UN is handling similar issues differently depending on who the member states are, then a question arises: How is the supposed neutrality and image of the UN as an honest arbiter affected by its differential treatment of members? And: What impact does this have for international justice? The World Court has ruled the Apartheid Wall (Wikipedia calls the 650-700-km structure that reaches a maximum height of 8 meters and cuts through much of the West Bank the “Israeli West Bank barrier”) to be illegal and ordered it torn down. William Parry’s picture book — Against the Wall: The Art of Resistance in Palestine (Pluto Press, 2010) — vividly drives home the oppressor-oppressed dynamic. The book portrays Israelis separating Palestinian families from one another, Palestinians being prevented from tending to their crops, Israelis inflicting economic deprivation on Palestinians, Israelis targeting of school children, and Israelis intended humiliation of Palestinian workers passing through checkpoints in the wall. Against the Wall also depicts the spirit, art, and determination of the Palestinian resistance, the anger of the occupied people, and messages to the world. In the case of Israeli Jews, the wall is their statement of desiring separation from Palestinians. In stark contrast, the 38th parallel on the Korean peninsula is a demilitarized zone forced by Americans on Koreans, many of who still desire reunification. Although undeclared, it is well known that Israel has a nuclear arsenal, yet it escapes censure by the US and sanctions by the UN. One might inquire how a state like the US with its huge stockpile of nuclear-tipped ICBMs has standing to criticize other states for doing what it does? Does this not pose a moral quicksand for the US? Also why does the US elude censure for not abiding by article VI of the Treaty on the Non-Proliferation of Nuclear Weapons? If Palestinians had been able to determine and control immigration to their country, as is the case for nation states everywhere, would they have allowed a group of outsiders to establish an exclusive state for that group’s people negating their own state? 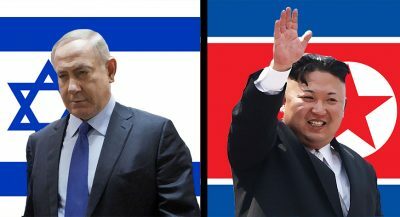 If the answer to both questions is no, then why are the Palestinians and North Koreans demonized for decisions made by outsiders that denied them their natural rights? On the one hand we have a self-designated Jewish State that was carved out from a landmass colonized by Britain. 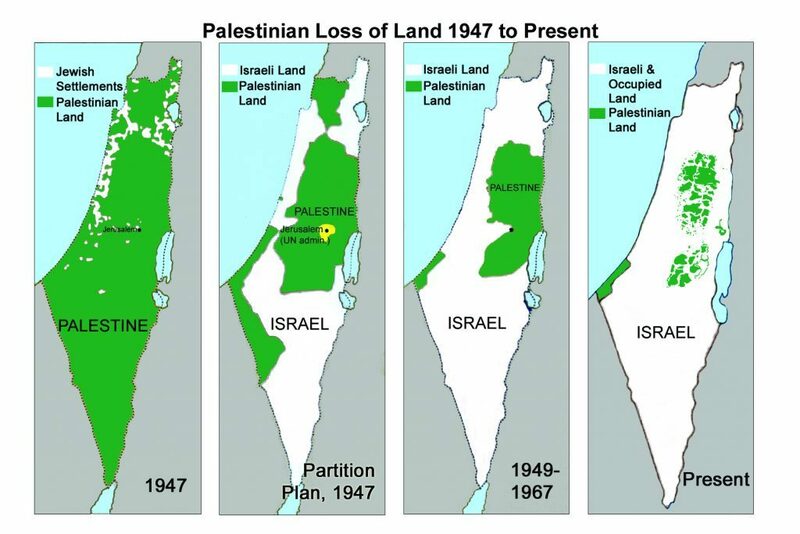 Britain passed the matter to the UN which took a chunk of the land and gave it to others, without the consent of the Palestinian people who for millenia have lived, loved, played, worked, and farmed there. Israel, the Jewish state, ethnically cleansed 800,000 non-Jews from the land and later expanded its non-declared borders. Israel is clearly a racist state. All this was with the acquiescence of the US. Israel has been in contravention of several UN resolutions, in violation of the Geneva Conventions, and has never been sanctioned by the UN. In addition, the US has exercised several vetoes in the UN Security Council to protect Israel from censure. As well, Israel became a nuclear-armed state with ICBMs. Does the US demand sanctions against Israel? No, it lavishes billions upon Israel each year; currently running at $3.8 billion a year. Most of this “aid”  is in the form of military assistance — which is being challenged as violating US law against supporting secret nuclear states. Korea, the state of the Korean people, saw its people separated into the two halves of the peninsula. This again was imposed from the outside, without the consent of the Korean people, chiefly by the US. North Korea has committed no acts of ethnic cleansing. On the contrary, it was the victim of major devastation caused by the US when the latter intervened in a civil war, committing numerous war crimes. The US threatened North Korea with nuclear weapons during the war on the Korean peninsula, had nuclear weapons stationed on South Korean soil for several years, has nuclear-armed warships docking in South Korea, has nuclear-armed warplanes and nuclear-armed submarines stationed in nearby Japan. Yet North Korea, in stark contrast to Israel, is singled out for the severest vitriol from the US and its western allies. The UN bends to the US through its Security Council imposing sanctions on North Korea although it has attacked no other country. It has pursued nuclear weapons and ICBM capability as has the US, Israel and the seemingly hypocritical China and Russia, the latter two nuclear states having voted for sanctions against North Korea. A simple analogy should suffice: If a bully — much larger than you and who has used unrestrained violence against you in the past — threatens you with a gun, would you want to face the bully without a gun? Is there a moral principle that would posit that North Korea should face the mightily armed US, a US which rejects peace with North Korea, without a deterrent to attack against it? Unless one can reasonably answer yes to the preceding two questions, then the punitive actions targeting North Korea should cease immediately. If actions targeting any entity are required, then how about targeting the entity/entities that caused North Korea to seek a nuclear deterrent? 1. Korea in the 20th Century: 100 Significant Events, (Foreign Languages Publishing House, 2002), p 98. 2. Korea in the 20th Century, p 98. 5. See Korean Truth Commission, Report on U.S. Crimes in Korea: 1945-2001 (New York: 2001). Featured image is from Al-Monitor.